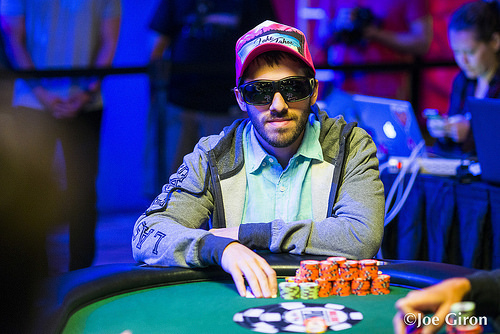 Leveraging blockers allows you to bluff and call with a slightly higher degree of success. A blocker is a card you see, either on the board or in your hand, that ‘blocks’ your opponent from having any hand containing that card. Poker is a game of small edges, and the small edge you gain by effectively utilizing blockers will have a notable impact on your long term win-rate. We'll go over each of these in this article, and we'll also touch on how significant blockers really are. 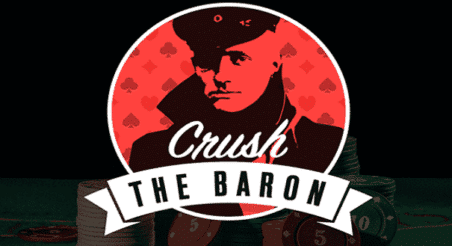 Have you ever felt unsure of which hands to 3-bet or 4-bet bluff with preflop? Blockers can make these decisions clearer. When we’re constructing our preflop bluffing ranges, we should use some hands that block the value range of our opponents. By choosing a hand with blocking potential, our bluff is less likely to run into a strong hand, which makes it more likely that our bluff will get through. Let’s run through a preflop example with range breakdowns to demonstrate how blocker removal effects work. If we break down this range combinatorically, we learn that Gabriel's range has 40 combos of premium hands that will almost certainly 4-bet (JJ+, AKs, AKo). Consider also that we block some of the strongest hands in our opponent’s calling range (AQ, AJ, AT) with this hand. Similarly, when facing a 3-bet, hands like Ax suited--and sometimes even offsuit--can function well as 4-bet bluffs because they block the three hands listed above (AA, AKs, AKo). Clearly, selecting our preflop bluffs based on their removal effects will lead to a higher frequency of success on average. This bit of theory often confuses people, but the logic runs as follows. 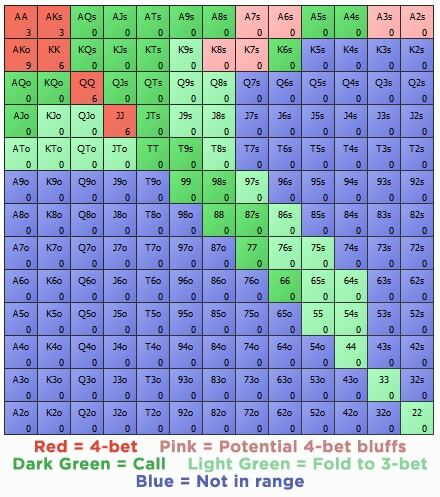 When you're facing a bet in a close spot, you should consider which hands in your range block the value hands that your opponent is representing, and lean towards calling with them. This will sometimes mean that you should call with a hand because of it's removal effects, and fold a stronger hand in the same spot because it lacks removal effects. $1/$2 Cash Game. $200 Effective Stacks. folds to sb. Hero raises to $7. BB calls. Hero checks. BB bets $9. Hero calls. Hero checks. BB bets $25. Hero calls. Hero checks. BB bets $65. Answer: 9♦ 6♦. This hand blocks the nut straight, two pairs and better top pairs. T♦ 9♦ might be a stronger hand in terms of pure value, but it actually has negative blocker effects–the T♦ blocks the BB from having one of the many missed straight draws in the BB’s range. J♦ 8♦ is even worse, because it doesn’t block the his top pair combos and still blocks missed straight draws. Keep in mind that blockers are only a small piece of the puzzle when constructing a calling range. In the above example, a hand like JJ has pretty poor blocker effects--it blocks some missed straight draws while blocking no value hands--but it's still better hand to call with than any of the options above. This is because JJ isn't a pure bluff-catcher in this spot, it actually beats some of the hands that the BB may be value betting (A9, K9, Q9). Sometimes strong players turn made hands with good removal effects into bluffs—a move most weaker players are often reluctant to make. PokerStars Zoom $5/$10. 4-Handed. Effective Stacks $631. Hero is on the BTN with 8♣ 8♦. CO folds. Hero raises to $21.50. SB folds. BB calls. BB bets $20. Hero calls. BB bets $50. Hero raises to $172.10. BB folds. In this hand, we use 88 as a bluff-raise after facing a bet on the turn and a barrel on the river. 88 is too low in our range and does not have enough showdown value to warrant a call. However, it blocks two hands straights that are probably in the BB's range: 86 and J8. And from our opponent’s perspective, our check on the flop and call on the turn means it is plausible that we have one of these hands (more likely J8, since 86 almost certainly c-bets flop), in addition to hands like 99 or Q9 that we may raise with on this river. If, hypothetically, our range contained no strong hands that would want to raise this river for value, we should probably never bluff-raise either. That said, we almost certainly have strong value raises in our range, here, so we need to pick some bluffs to balance our range and make us tougher to play against. 88's double blockers and poor showdown value make it one of the best possible candidates. Blockers play an important role in optimal decision-making, but it’s easy to overestimate their significance. For one thing, our holding blockers doesn’t mean that our opponent can’t have the hand we are blocking (except when we hold a particular flush blocker). It just makes it less likely. Many players go haywire and make decisions based on blockers way too often. Don’t make this mistake. You should always think about your entire range when making a play, and only after you’ve considered all the relevant factors should you decide what to do. If a certain play clearly doesn’t make sense, then don’t do it. Turning a hand into a bluff when the hand actually has sufficient showdown value to call versus the opponent’s range. Don’t be put off by these last few points. Blockers are an integral part of playing perfect poker, and so you try to mix using them into your own game. Give me a shout in the comments below if you've got any recommendations for future articles!